We know that keeping a canoe or kayak hidden away until the big day isn't always easy, that's why we are offering free storage on purchases from now until Christmas. 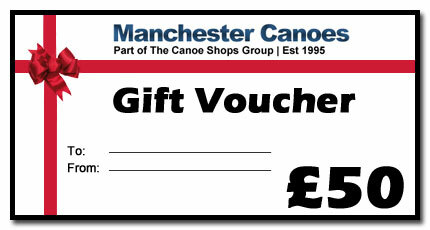 Simply place a deposit or pay in full to secure your canoe or kayak and we'll store it up until the middle of January. All Christmas presents must be paid for in full at the time of (or before) collection. This allows you the option to collect your canoe or kayak at your convenience ready for Christmas or to give the recipient of your present a gift card on the day and collect it January, or in the holidays between X-mas and New Year. If you have any questions then please call us on 01925 818437, our team of Santa’s elves are all keen paddlers, and happy to offer advice or answer any paddle-sport related questions! We all know how difficult buying a present can be so we offer our own Gift Vouchers that can be redeemed off any product either online or in the shop. Buy online and we'll email the voucher to you.